Product prices and availability are accurate as of 2019-03-26 09:47:13 EDT and are subject to change. Any price and availability information displayed on http://www.amazon.com/ at the time of purchase will apply to the purchase of this product. 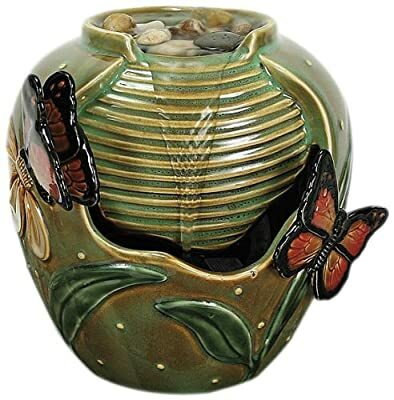 Foster a soothing atmosphere in your home with our well-loved Butterfly Beauty indoor fountain. This colorful water feature is meticulously-crafted from premium porcelain. Decorative pebbles are included for placement in the top spill-cup, enhancing the pieces natural appeal. Comes complete with a two-speed pump and an on/off switch. The Butterfly Beauty Fountain serves to add moisture to surrounding air while it promotes tranquility with the pleasing background of falling water. An ideal size for display on a desk or end table, this piece is perfect for any room. Hand Glazed Porcelain Two Speed Pump Included Indoor/Outdoor 6" x 6" x 6.5"